A sprawling dynasty. An ancient bloodline. A world of magic and mayhem. Welcome to the Saga of Crimson & Clover, where all series within are linked but can be equally enjoyed on their own. The Midnight Dynasty Series: There’s no place like home. 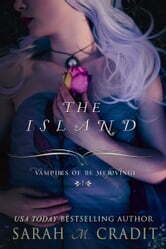 Vampires of the Merovingi Series: From the ashes of the sorcerer kings rose an empire. The Seven: Seven Siblings. Seven Years. Seven Spellbinding Novels. Visit www.sarahmcradit.com for the latest information, news, and updates. The Island: Vampires of the Merovingi is an amazing book. I love the detail. I can see what Etienne sees, feel what he feels, and even smell the scents from around him. I am captivated by Etienne's battle with his fiend, along with his internal struggle. I could not put this one down.